Using Australian native plant extracts and Argan Oil Truly Blonde shampoo and is specifically formulated to remove unwanted yellow tones from grey bleached and highlighted hair preventing brassy tones and protection from the sun and pollution. The sulphate free formulation ensures healthy and lustrous hair and scalp condition, whilst the Argan Oil locks in intense moisture, the Kakadu Plum extract and Aloe Vera rich in vitamin C and minerals and amino acids return the hair to the appropriate pH level and leave the hair soft yet manageable. Australian native Kakadu Plum has the highest concentration of natural vitamin C of any known plant protecting the elasticity of the hair structure Argan Oil provides hydration and silkiness to the hair as it contains many vitamins and fatty acids that have amazing healing conditioning properties for the hair shaft and scalp. WITH NATIVE KAKADU PLUM EXTRACT Kakadu Plum (Terminalia Ferdinandiana) is found in the Northern Territory and contains the highest concentration of natural Vitamin C f any known plant. Vitamin C is a natural antioxidant that eliminates free radicals and helping to prevent damage to the hairs’ cell structure. It also stimulates the production of Elastin and Collagen to help maintain suppleness in the hair. 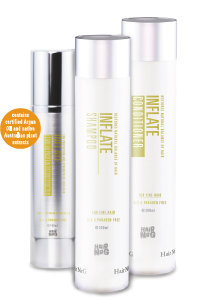 Using Australian native plant extracts and Argan Oil Inflate shampoo and Conditioner is specifically formulated to balance the sebum levels of fine hair whilst protecting hair from degradation by the harsh Australian climate, sun and pollution. The sulphate and paraben free formulation ensures healthy and lustrous hair and scalp condition, whilst the Argan Oil locks in intense moisture, Lemon Myrtle and Aloe Vera rich in vitamin C and minerals and amino acids return the hair to the appropriate pH level and leaves the hair soft yet manageable and protected against damaging U.V. Lemon Myrtle (Backhousia Citriodora) can be found in subtropical rainforrests of Queensland and contains slightly astringent fruit acids that help to control sebum and problematic hair. It is high in Vitamin C which assists in the generation of new cell growth and also contains the purest source of Citral to help maintain circulation. Using Australian native plant extracts and Argan Oil Strengthen shampoo is specifically formulated to protect colour treated hair from degradation by the harsh Australian climate, sun and pollution. The sulphate free formulation ensures healthy and lustrous hair and scalp condition, whilst the Argan Oil locks in intense moisture, the Kakadu Plum extract and Aloe Vera rich in vitamin C and minerals and amino acids return the hair to the appropriate pH level and leave the hair soft yet manageable and protected against damaging U.V. Kakadu Plum (Terminalia Ferdinandiana) is found in the Northern Territory and contains the highest concentration of natural Vitamin C f any known plant. Vitamin C is a natural antioxidant that eliminates free radicals and helping to prevent damage to the hairs’ cell structure. It also stimulates the production of Elastin and Collagen to help maintain suppleness in the hair. The end to haircolourist nightmares. 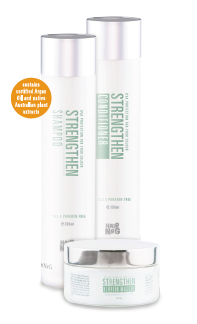 Strengthen Ultra add more bonds to the hair structure whilst bleaching. Click here to download the Strengthen Ultra range information sheet. 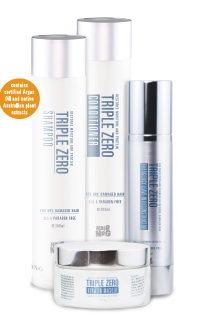 Using Australian native plant extracts and Argan Oil Triple Zero shampoo is specifically formulated to infuse conditioning moisture into the hair shaft, and protect hair from degradation by styling tools Blow dryer, styling irons and the harsh Australian climate, sun and pollution. The sulphate free formulation ensures healthy and lustrous hair and scalp condition, whilst the Argan Oil locks in intense moisture, the Kakadu Plum extract rich in vitamin C and minerals and amino acids return the hair to the appropriate pH level and leave the hair soft yet manageable and protected against damaging U.V. Triple Zero Conditioner contains Macadamia Nut oil rich in vitamin C, Apricot Kernel extract returns the hair to the appropriate pH level and leave the hair soft yet manageable and protected against damaging U.V. Apricot Kernel Oil (Prunus Armeniac) is cold pressed from the kernel of the apricot and contains essential fatty acids oleic and linoleic acids. It is high in Vitamin A and E which helps keep the hair smooth and supple. The oil helps hydrate and soothe ir­ritated skin and hair. Using Australian native plant extracts and Argan Oil Defendz Endz is specifically formulated to balance the sebum levels, seal and strengthen the cuticle whilst providing heat protection. Defendz Endz also protects from degradation by the harsh Australian climate, sun U.V and pollution it also protect against damaging aspects of chlorine pools and sea water, offering protect and extending the life of Frizz Endz Keratin Brazilian Keratin Treatment This uniquely designed product Defends Endz has been created as a light cream polish to seal and strengthened cuticle whilst providing heat protection to the mid-lengths of the hair. Hair becomes damaged during brushing combing and blow drying. Defends Endz will add fabulous shine, prevent the hair breakage colour fade and split ends, whilst adding moisture, shine and softness. Protects against the sun and elements. 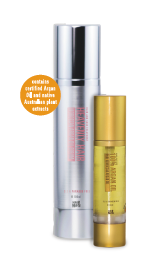 Using Australian native ingredients and Argan oil heavenly hair leave in moisturiser is a combination of the cold pressed oil from the kernel of the apricots which contains essential fatty acids high in vitamin C and E to keep the hair smooth and supple hydrating and smoothing dry hair and skin. Argan oil provides hydration and silkiness to the hair containing many vitamin and fatty acids that have amazing healing properties vitamin E and Lineoic Acids help protect the hair from oxidization (ageing) environmental pollution and harsh UV rays. Argan oil is non greasy and light, which allows it to penetrate the hair shaft and balance the oil levels of both the hair and the scalp. 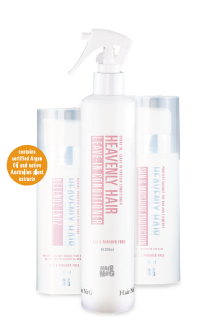 Using Australian native ingredients and Argan Oil plus natural ingredients, Heavenly Hair leave in conditioner is a combination of silk and wheat proteins that make the hair soft, silky and shiny reducing tangles Heavenly Hair leave in Conditioner is ideal for people with long hair or young people who need additional de tangling conditioning between shampooing. Heavenly Hair Leave in Conditioner with Argan Oil is a weightless formulation so doesn’t make the hair feel lank and heavy. Lemon Aspen found in tropical North Queensland restores the hair’s natural pH Balance. Argan Oil is a natural product rich in antioxidants containing vitamin E, fatty acids and antioxidants. It is a wonderful moisturiser and conditioner that will nourish and bring back moisture to your skin and hair. Argan Oil cures and reduces split ends giving back healthiness, elasticity, strength, shine and bounce to your hair. It helps alleviate a dry, itchy scalp and reduces the occurrence of hair loss and dandruff. Argan Oil is a natural product without any chemical. It is safe to use on any skin or hair type at any age. It is suitable for long or short hair, curly or straight, fine or thick, coloured or natural hair. Directions: Massage a couple of drops of 100% Argan Oil into the hair and skin daily. Heavenly Hair Moroccan Argan Oil serum provides hair and skin with immediate moisture creating a lustrous finish and hydration. The rich combination of Native Australian Macadamia Oil and Argan Oil make the hair and skin feel soft and silky whilst it leaves no residue, avoiding greasiness or heaviness. Heavenly Hair Oil of Morocco Serum restores both chemical and environmentally damaged hair. The unique formula allows you to control dry, frizzy unmanageable hair. It provides instant smoothness and softness to hard unruly curly hair. Directions: Apply 2-3 drops into wet or dry hair distribute for perfect control and remove frizz. Argan Oil: sourced from the kingdom of Morocco located in North Africa. Argan oil is cold pressed oil from the kernel of the Moroccan argan tree known within the kingdom for many years to be so beneficial for hair and beauty products. It is quickly become regarded as one of those miracle ingredients added to your daily beauty care and haircare will find your hair, skin to be in better condition and less ageing effects and dryness. This incredible product gives hold and flexibility to any hairstyle and adds shine and volume allowing the wearer to create, until now, unachievable results using wet or dry, long or short hair. 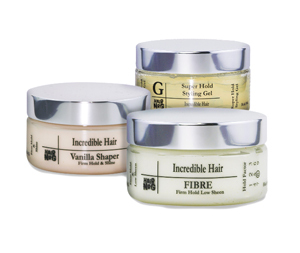 Vanilla shaper will add a new dimension to your hair. This gel offers substantial holding power. firm hold gel is easy to use and a small amount will give you powerful results for short spiky hair, we guarantee exceptional results with this stronghold, easy-to-use gel. Shiny hair that stays in place all day.